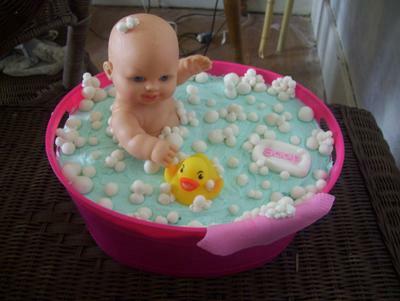 I made this adorable bathtime bubbles baby cake. I purchased a plastic party tub, plastic baby doll and a rubber duck. Bake off a full sheet pan size cake (about 4 cake mixes). Make a template from a piece of foam poster board using the tub to trace the top and bottom of the tub. When the cake is cooled flip onto a flat sheet pan.Lay the template on top and cut shapes with a serrated knife. Leave the templates on top of the cakes. Using a flat sheet pan gently flip them over. There are now two cakes. Put the first cake in the bottom of the tub. Spoon on some butter cream icing, smooth it out. Now using dowel rods cut to size insert them. Next add the second cake (foam board side down). Then cut a hole to fit the doll in a sitting position. Place doll in the hole and spread a light blue icing over the top of the cake and dolls legs. Then using fondant roll out a piece to make the wash cloth, and a bar of soap. Use tiny pieces of fondant and make different sizes balls. In a baggie put edible glitter and add the balls of fondant. Shake well,to get a even coat. Then do the same to the bar of soap. Add all the details to the cake. Give it a once over sprinkle of edible glitter. 6 cups of butter cream icing. 24 oz. of ready to use fondant. 1 bottle of edible pearl glitter. foam poster board or cake board. Roughly what size was your tub for the doll and did you leave the legs on the doll? AMY, THAT IS A DARLING CAKE AND WHAT A COOL IDEA. I LOVE TO SEE DIFFERENT IDEAS THAT EVERYONE HAS. SOME PEOPLE LIKE YOU HAVE SUCH A TALENT, KEEP IT UP!!! !